I’ll begin with the book that gave me the idea for this blog post. Only published in 2015, Last Stop on Market Street has received an outstanding number of book awards in the USA, so I felt compelled to order a copy (I’m a bit of a pushover). When it arrived I opened the book and paused at the first sentence: CJ pushed through the church doors and skipped down the steps. I wonder if some of you think it's weird that I paused? 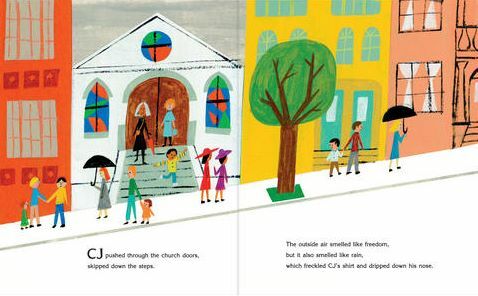 For me in the UK, it was the mention of the church doors in a mainstream picture book. Of course we all interpret books to reflect our beliefs, but in this book it’s clear the grandmother and child have been to Sunday church. After my surprised ‘pause’, I realised it could be a cultural difference between the UK and USA. In the UK, I don't think it's usual for contemporary picture books to overtly include Christianity unless the books are specifically religious. Also, UK publishers rely on overseas editions and I suspect that makes them cautious. So although the message in the excellent Last Stop on Market Street is one of finding beauty in less obvious places, it’s so specifically a story set in urban America, with the speech cadence of a specific community, that perhaps it’s a story that doesn’t travel well outside the USA? Or perhaps you think I'm nuts?! Cute animals are sooooo cute. We adore them in picture books. So it was a refreshing surprise to discover the baby bird in Croc and Bird was, well, how can I say this… Not cute. This book is about being true to yourself and the people who matter, and is one of my favourites (and sometimes I still pause and grin). Now we come to the third book. A bad ‘pause’ (in my opinion). "I may be a silly," Mr. Bear answered, "but I know when a naughty little girl needs a spanking." Little Bear couldn't watch. He was afraid his turn was next. And yes, Little Bear gets a spanking too in the next image. Nuff said. This is another picture book that gave me a bad, shocked ‘pause’ when the robbers blew pepper dust at the frightened horses. However, when I finished the book I had a rethink. The robbers do terrible things, but is redemption possible? I’m not comfortable with the book, but I suspect it’s not meant to be ‘liked’; it’s meant to make adults and older children think about redemption. It was first published in German in 1963, then reissued in 2008 (Phaidon). The text with the image below reads: To stop carriages, the robbers blew pepper dust in the horses' eyes. Here’s another book that could get us all thinking and I ‘paused’ several times. It's Syrian and currently only in Arabic (though my copy included two separate sheets with the text translated into English). 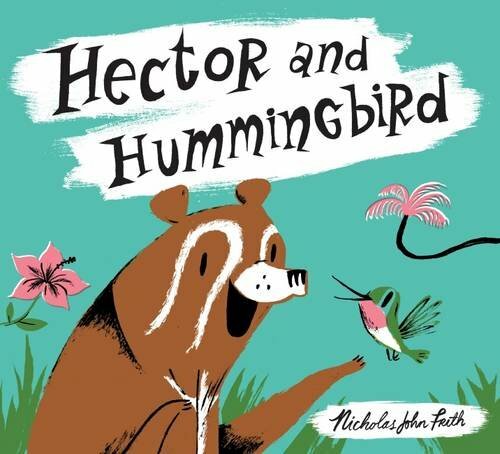 On the surface this picture book is about a family coping with living in a city that has become dangerous and scary. 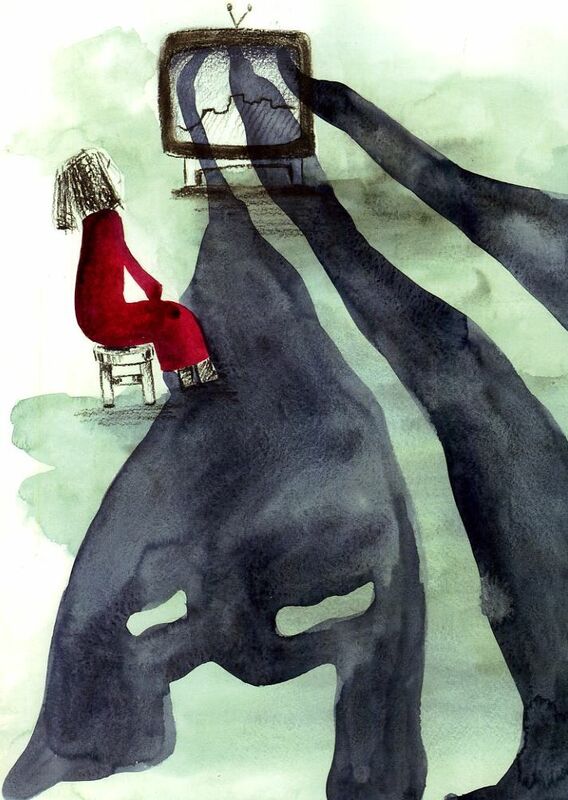 Parts of the story and illustrations are darker than the picture books we’re used to seeing in the UK, but even in the UK not all children live in safe neighbourhoods and most catch glimpses of the TV news. At first I questioned why the story didn't include the word 'war'. Nadine Kaadan (who has lived in the UK since 2012) explained that back in 2011, when she began the story, Syrians like herself didn’t believe the fighting around them was a ‘war’. They thought it would soon be over. Sadly not. Now I’ve thought more about the story, I can see it has a wider appeal by not specifically mentioning war. The ambiguity works well. For example, it could also be seen as coping with a depressed parent, or coping with living in an unsafe environment, or simply coping with not being allowed outside to play. Don't worry, there is a positive, uplifting ending. As the owner of cute picture books by Satoshi Kitamura (eg the Comic Adventures of Boots), I experienced a surprised ‘pause’ when I discovered his illustrations in The Yes (Andersen Press, 2015). For me it was a good surprise because the images are innovative for picture books. Some of the pictures are almost semi abstract, though always understandable and always interesting. Another from Andersen Press (2010). I definitely paused when I came to this double-page spread. I was flabbergasted, bemused and then giggled. What more can I say?! Well I could tell you the text and then you might understand: So as they went in - every dog, pooch and pup -They took off their bottoms and hung them all up. Hundreds and hundreds of little pink 'o's All neatly arranged in methodical rows. When I’m in a bookshop I read a lot of picture books. Some I skim and some I read (and some I even buy - honestly!). 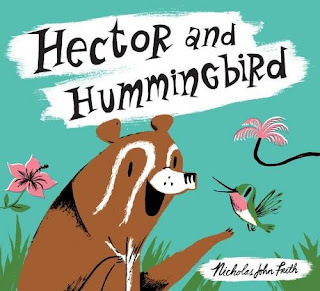 So whilst in a bookshop I began to flick through Hector and Hummingbird (Alison Green Books, 2015) because I liked the colours and contemporary-retro illustrations, and then I paused. The snippets I'd read made me smile so much, I returned to the beginning and read it all through. It’s not often I come across such charming fun (it’s about coping with an annoying, overly chatty friend). A delightful ‘pause’ and a gentle place to finish my list. I've had many more picture book 'pauses' but I think I've prattled on enough. Perhaps you’ll let me know your good, bad and surprising ‘pauses’? Many thanks, Catherine, though now I'm worried you won't enjoy them (whichever you picked, though not number 3, I suspect!). 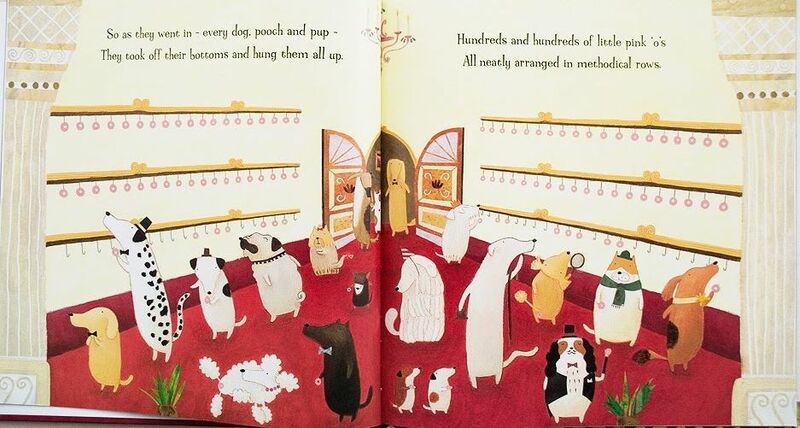 A freind of mine texted me when he first came across that page in The Great Dog Bottom Swap in a book shop – it's quite a jaw-dropper for a kids' book. But entirely justified in the context of a very clever, very funny story. Yes, I agree the the humour is in context and clever, Jonathan. As a dog owner, I grinned. But what happens in the Great Dog Bottom Swap after they've hung them up? How can you be so cruel as to not tell us? Ha ha, Penny, I'm cruel. However, if I say that during an evening of wonderful entertainment there's a fire and all the dogs leave in a hurry, I suspect you can guess the outcome because the story is an explanation of why dogs sniff other dog bums! 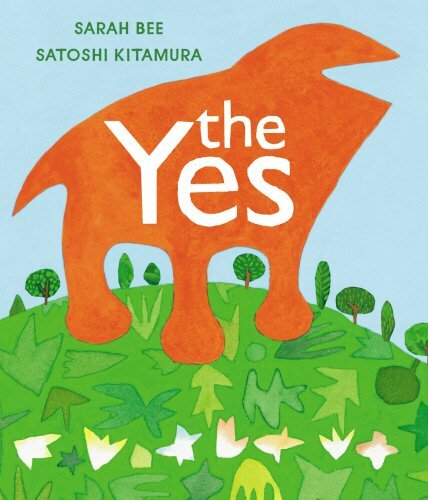 Looking forward to reading 'Tomorrow' and 'The Yes'. And the Tomi Ungerer one. He's done some amazing stuff. Thank you. Thanks Clare. I have one other book by Tomi Ungerer, 'Fog Island', a 2013 book inspired by Ireland. It's more of a straight-forward folk tale and the illustrations aren't as stylised and to me aren't as interesting (apart from the moody ones that don't include people - I adore those). Really enjoyed this brilliant piece. You've made me desperate to get to a bookstore! Thanks so much, Candy. I wonder if you'll pause too - different readers react in different ways and now I'm worried! 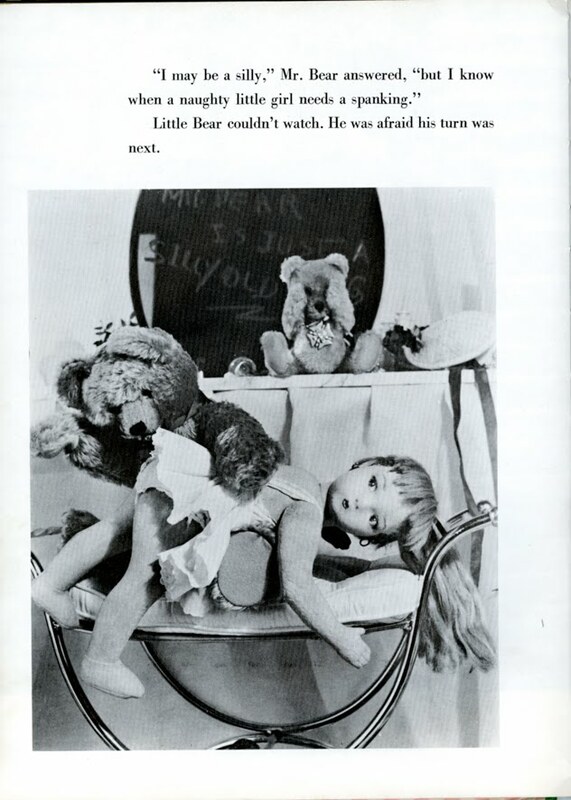 So many I've spoken to find The Lonely Doll disturbing, but as a kid I adored it! Great post! Many thanks, Julie. I suspect I too would have enjoyed it as a child (ie the 60s!). I very much like the idea of using photos of dolls, teddy bears, etc., and the black and white is atmospheric (though nowadays I suspect a child would want colour), but obviously our attitudes have moved on. I was surprised at the late 90s reprinting by a mainstream US publisher. What a fascinating hoard of examples! Very thought-provoking. The challenge of producing a picture book about war is particularly urgent. Thank you so much, Paeony. Thanks a lot, Pippa. There were lots of books I didn't include so I might do it again and 'You Choose' should be in the list (a good/surprised pause! ); though I feel self-conscious about including fellow Picture Book Den authors as I wouldn't want readers to think I'm biased (which is why I didn't). Many thanks,Janey, though I wasn't deliberately trying to encourage people to buy the dog bottom book!! Hands up! I have to confess that 'The Three Robbers' was one of my absolute favourite books as a little girl. 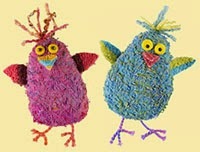 I think it was mostly to do with the images though, they still stay with me. That and although a very cheerful upbeat kind of person by nature even from small I was always fascinated by the darker side of life. It's fascinating to hear that as a child you appreciated The Three Robbers - it's quite sophisticated and I did wonder if adults like it more than children. It's lovely to know my prattle about picture books is appreciated - thank you, Frances. 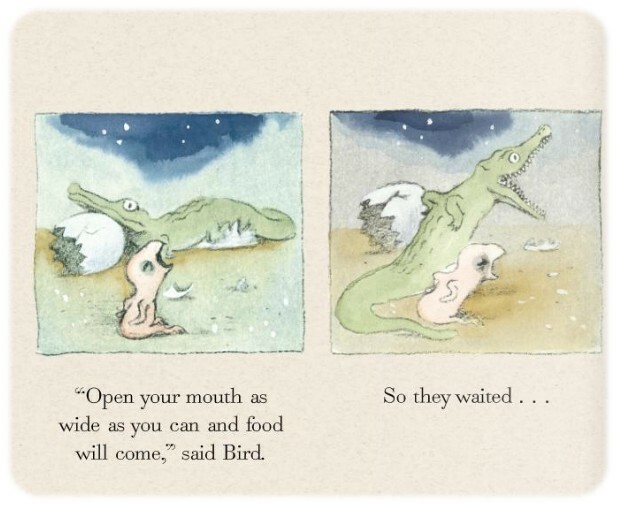 Croc and Bird is a wonderful book and my favourite image goes with the simple line: 'At lunch, Bird caught a buffalo.' It made me giggle and is so wonderfully understated. Hmm, I think you'll have to see it to understand what I'm wittering about! I'm not sure how to get Tomorrow as it's in Arabic - I bought it at an event, though I do wonder if a UK publisher might be interested. Brilliant - now I know what I'll have to list in a future blog post! Thank you so much, Mandy. I grinned at: "I hope I'll be good." Adore your sherbert lemon analogy. I don't think you're nuts! 1 and 3 were my biggest pauses. I'm not a dog fan but the bottom swap story is clearly a winner in an unforgettable, hilarious, world-rethinking way. Phew, I'm glad I'm not alone with Pause 1 (though I want to stress it's a good book). There were some interesting comments on FB and somebody made the thoughtful observation that the story might be perceived as being not quite so mainstream in the US if we replace 'church' with 'mosque' or 'temple'. Thanks, Lydia. A book that made me pause and laugh out loud was 'Tadpoles Promise.' Who'd believe a publisher would be brave enough to let an author kill off one of the main characters. Yes! 'Tadpole's Promise' is a good choice, Lynne. Though perhaps it goes beyond a 'pause' and into a 'gulp'?! And another great Jeanne Willis /Tony Ross title - Susan Laughs. The last spread, the first time you read it, is sure to bring a gasp of something - surprise / delight / shock? I don't know 'Susan Laughs' - I'll hunt it out. Thanks, Malachy. I wrote a story with a main character whom I wanted the reader to dislike. Editors said " we didn't find the character likeable enough". I was amazed. He wasn't supposed to be liked. 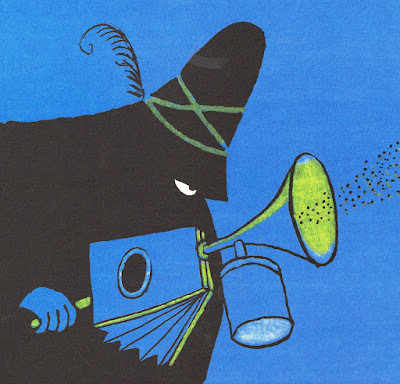 So with regard to the Tommi Ungerer, yes, baddies are baddies. They might have a heart, but some don't. I agree wholeheartedly with Market St, which to me feels like watching an episode of Sesame St. The reality is many black children and their parents or grandparents attend church. Over here in the Uk, people seem to view those who go to church as the antichrist. I see it all the time. So would a black family over here enjoy the book? Yes, but less so perhaps for the Americanisation of the book. The dog's bottom story is based upon various songs brought out in the fifties I believe, all with similar 'endings', some naughtier than others. Great book.